This Clover cool white LED switched wall light in polished chrome with crystal is ultra-modern, contemporary and on-trend. 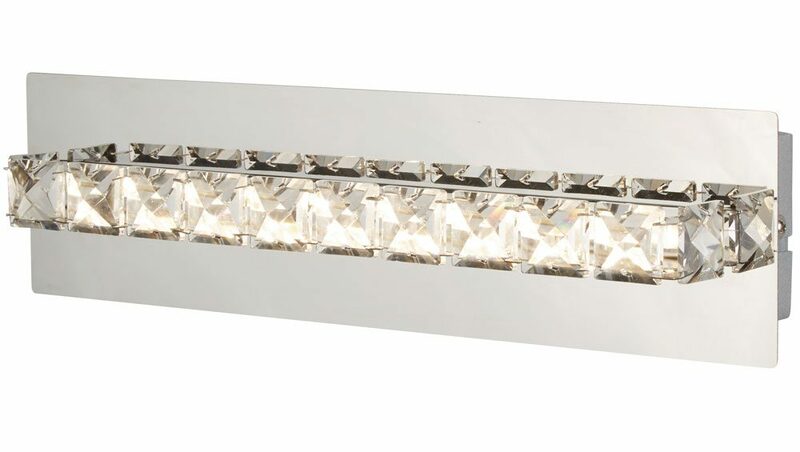 Featuring a rectangular wall bracket and mirror chrome face plate, with central row of faceted crystal squares that adds a touch of glamour to any wall. The 4.2w LED’s sit behind the crystals creating 352 lumens of sparkling light and fitted with a discrete rocker switch on the back plate. A glamorous and chic wall bracket is complete with adorning clear crystal detail on a chrome body. Light shines through the crystal and the cool white light gently illuminates nearby areas. Perfect wall lighting for any stylish dining room, bedroom, hallway or living room wall. A double insulated wall light no earth required. There are matching fittings available in the Clover cool white LED lighting range; please see below. This on-trend light is supplied by Searchlight who manufacture some of the best traditional and modern classic designs such as the Clover cool white LED switched wall light in polished chrome with crystal you see here.